I can’t believe we are in June already! Seriously, how does the time go by so fast? I enjoy this season so much and would love to hit a pause button! I apologize for not posting more often on here. I have been so busy with a number of things which I will do a quick photo tour of..
A huge deck renovation we have going on..
Getting ready for the vintage fair..
And of course doing the usual fun spring time activities like sitting around the fire, fishing, walks, etc.. I could have sat here all day! Now, on to the end table makeover! I got this table from someone awhile back and finally got around to doing something with it. I gave it a coat of gray paint and designed a Roman numeral, French style clock on the top. I used my Silhouette Cameo for the numerals and parchment paper for the center. I know there’s all kinds of tutorials out there on how to get all the numbers nice and evenly set apart, but being in the usual hurry that I was, I just gave it a shot by guessing. It’s not perfect but it will work..
After adding the design to the top, I applied wax to give it a smooth, protective finish. The table will be available at the Walnut Creek Vintage Fair on June 24th. Mark your calendars, it’s coming up! Have a great rest of the week, you all! Today I will be showing you before and after pictures of two pieces of furniture I painted for people recently using Spectral colored paint. I cannot keep enough of this paint on hand! Some may say white is white, but with all these years of painting I have discovered that it’s not. There are many different shades of white. Spectral is a nice gray/white color. It has so little gray in it that you may not be able to see it without holding a stark gray color beside it. It is presently one of my favorite colors. I redid a hutch and chest recently using Spectral colored paint. Here are the before and after shots.. It is difficult to see the exact shade of white in a picture, but at least you can see it received a major transformation. The inside is painted with a dark gray paint that I’m not sure of the name anymore. The owners want to change the hardware yet, so that will add a nice, modern farmhouse look. I used my sprayer to apply the paint and since there is a primer in the paint already, I didn’t apply one separately. With a lot of old pieces of furniture like this, I ran into old stains creeping through the paint. To solve this, I started using gray Rustoleum spray paint primer. It works great, giving it a light coat that will blend in perfectly with the paint I apply using my sprayer. I only applied this spray paint where the stain came through, not over the whole piece. After it was dry, I them resumed spraying the white water base paint over it. After the paint was nice and dry, I distressed the edges and gave the piece a coat of Polycrylic, using my sprayer. 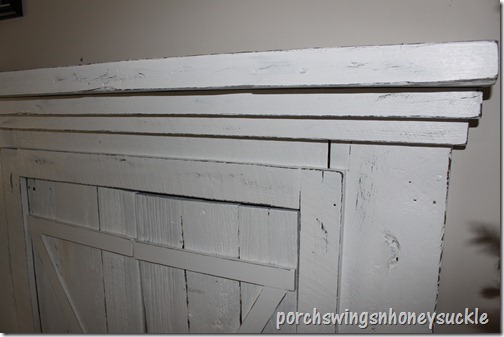 I am a strong believer in using Polycrylic to protect the painted finish on most pieces of furniture. I always buy Minwax’s Polycrylic, but there may be other brands out there that would work too. Here is the other piece I did at the same time.. The only prep work I did on both these pieces was going over them with Krud Kutter, a deglossing/cleaning product. (I love this stuff) At times I will sand a bit too, but for these pieces it wasn’t necessary. For this chest, I didn’t want the grooves to get any paint, so I rolled up masking tape and stuck it into the cracks before painting. After a few coats of Spectral paint..
After the paint was dry, I distressed the edges and gave the whole piece a coat of Annie Sloan wax. I hope you enjoyed this Monday makeover and are inspired to redo old, unwanted pieces of furniture. It’s truly amazing what paint can do! Okay, I’m not a poet by any means, but isn’t this true? There’s nothing more cheerful than a fresh bouquet of flowers on the table or mantle. In the spring time I always vow I will keep all my vases filled with bouquets of lovely blooms through out the growing season, but of course I don’t always get it done. The last several weeks we have been blessed with trees and shrubs just bursting forth in blooms, so I did manage to bring a few of them inside for all to enjoy.. The same boy brought me these flowers recently, all fixed in a jar.. I cut off some Dogwood blooms for the mantle.. I also have an idea for the fireplace wall that will hopefully happen sometime this summer. I haven’t run it by hubby yet, but will soon. I’ll probably start out by mentioning something major of an idea I have, like knocking out a few walls, or adding an addition to the house, then I’ll say or we could just go for installing shiplap on the fireplace wall…? Worst case scenario first, then the actual idea will seem so minor. No, really I kid about it. We are usually on the same page with projects, thankfully! He likes a new look too. I hope you all are enjoying this spring!